Ahhh... This is what you've been waiting for! Step out onto Corolla, NC beaches and savor the white sand and sparkling blue water. 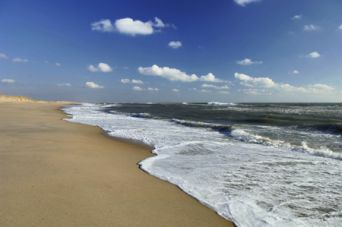 Corolla beaches are clean and wide with rolling, windswept dunes. Corolla is home to several upscale vacation rental communities, which offer both private and public beach accesses. Corolla beaches are patroled by Lighthouse Resort Services from Memorial Day to Labor Day. Enjoy your time in Corolla NC, but be sure to stay safe! Review all general Beach & Ocean Safety Guidelines before your Corolla, NC vacation. Pets are permitted on the beaches of Corolla, NC but must remain on a leash. Bonfires are not permitted anywhere on the beaches of Corolla, NC. Retrieve all personal items on the beach in the evening(including tents and cabannas). Unattended items will be removed. Corolla NC Lifeguard Stand Locations: The following stands are manned from 10:00 am - 6:00 pm from Memorial Day to Labor Day. In addition to lifeguard stands in Corolla, North Carolina, Lighthouse Resort Services offers 9 roving ATV units and 3 QRV units each manned by certified EMT. ** Indicates stands manned until Labor Day. Please note that this information is subject to change without notice. For additional information, please contact Lighthouse Resort Services at (252) 453-6232 or by email at info@lighthouseresortservices.com.